First off, I would like to say that if you have the time, I recommend you read the actual paper. Andy Penaluna and his team have done a remarkable job of maintaining the document to within 36 pages, given the richness of the content. However, for those of you who are more time-strapped, our overview will give you a useful summary of the contents and help you quickly reach the parts of most interest. In addition, we have added a little more value by suggesting how the Guidance may be used in designing your own entrepreneurship program. 1.1 The introduction and context (pages 1 - 6) gives a context to the Guidance. It states the purpose of the document, why EEE is important and then lists initiatives at a UK, European and international level that are supporting and driving this education. “ Learning about and experiencing Enterprise and Entrepreneurship while at university can have several benefits. It gives students alternative perspectives on their career options and ultimately, the confidence to set up their own business or social enterprise. Enterprise competencies will be useful to those in employment, or those who become self-employed and work on a freelance or consultancy basis. It can help develop a ‘can-do’ confidence, a creative questioning approach, and a willingness to take risks, enabling individuals to manage workplace uncertainty and flexible working patterns and careers. 1.2 Definitions and distinctions (pages 7 - 10) suggests some definitions and should help with conversations around entrepreneurial education. I have some doubts if these definitions will stick forever as they sound too similar, but they are a useful start. The section ends with a comment on the relationship between employability, enterprise and entrepreneurship. 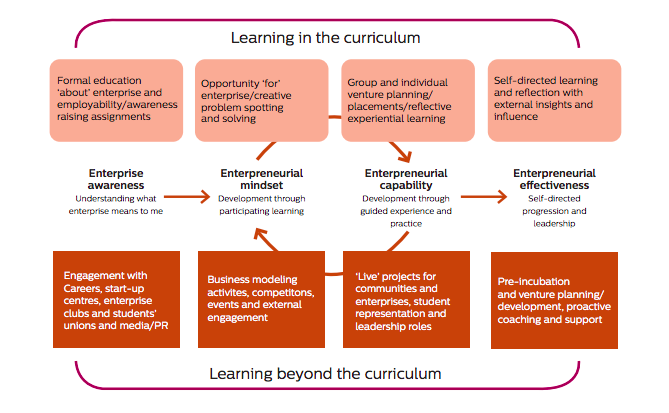 Enterprise Education is defined here as the process of developing students in a manner that provides them with an enhanced capacity to generate ideas, and the behaviours, attributes, and competencies to make them happen. It extends beyond knowledge acquisition to a wide range of emotional, intellectual, social, cultural and practical behaviours, attributes and competences, and is appropriate to all students. Entrepreneurship Education aims to build upon the enterprising competencies of students who are capable of identifying opportunities and developing ventures, through becoming self-employed, setting up new businesses or developing and growing part of an existing venture. It focuses on the application of enterprising competencies and extends the learning environment into realistic risk environments that may include legal issues, funding issues, start-up and growth strategies. 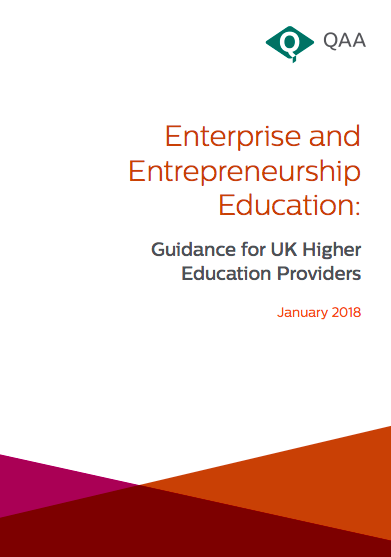 Entrepreneurial Education is used here as a ‘catch all’ term that encompasses both Enterprise and Entrepreneurship, and may be used when discussing the combination of both. 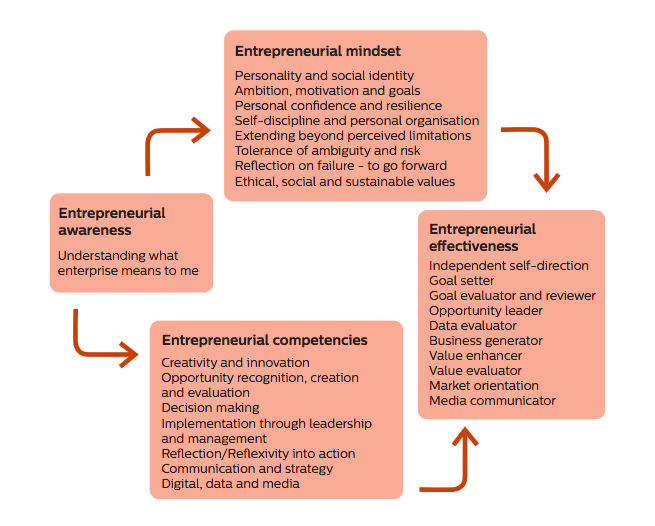 1.4 Delivering enterprise and entrepreneurship education: delivery (pages 13 - 17) dives into how entrepreneurship education might be delivered depending on the behaviours, attributes and competencies they wish to develop. It includes a useful section distinguishing between: ‘ learning about’, ‘learning for’ and ‘learning through’. 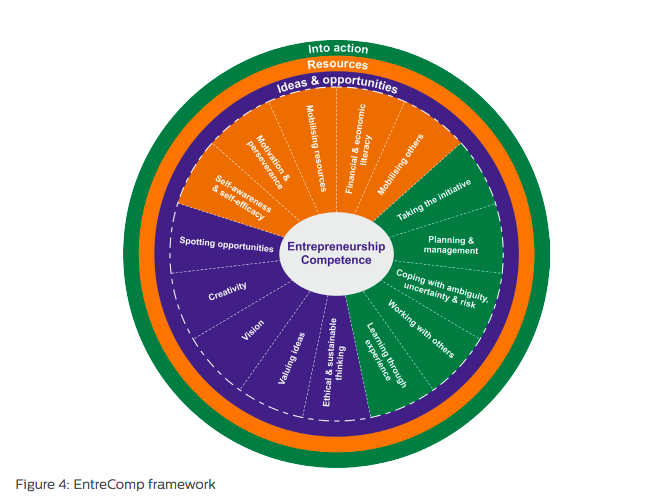 It then discusses assessment, evaluation and impact including a description of the Entrecomp framework developed by the European Commission (to be discussed in some detail in our next blog). This section is discussed in more detail below. 1. The 4 steps in the journey (which are not necessarily linear) and what is included in each step or what the student should learn. 3. What sort of thing should be taught at each step; and whether that is in or out of the curriculum. 6. What should be practised by the student to reach these outcomes. An alternative model is mentioned in the Guidance: the European Commission EntreComp framework. This framework considers 15 competencies and then allocates them across 3 areas (see figure 3). We initially thought about how to visually represent all these element in some sort of a multidimensional model. However, on consideration of the extreme (where every node has an element of each of the dimensions) and even ignoring the EntreComp framework, there would still be in excess of 2000 nodes which would not result in a practical (ie usable) model. We have analysed the Guidance into its basic components and based on the decision tree above, developed a simple algorithm that takes inputs and converts them into a suggested high level design for your enterprise or entrepreneurial program. You simply need to answer the questions (it should only take about 5 minutes) and you will receive a report within 24 hours. 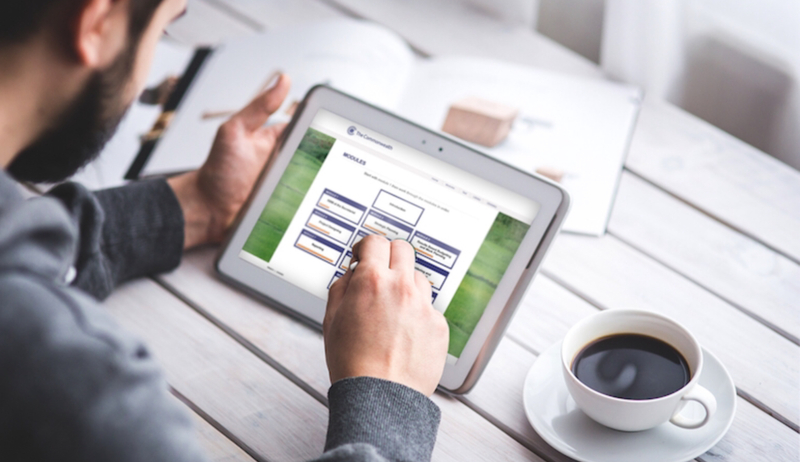 In addition, we will also keep all respondents up to date with the development of this tool.